Professor Volker Straub was founding joint co-ordinator of TREAT-NMD, and is an executive board member of the World Muscle Society and R&D Director of the North Tees and Hartlepool NHS Foundation Trust. 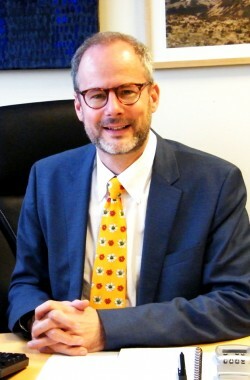 Together with Hanns Lochmüller, Volker was responsible for setting up the German national muscular dystrophy network, MD-NET, of which he was joint coordinator until 2008. Volker trained as a paediatric neurologist at the universities of Düsseldorf and Essen in Germany. After completing his PhD thesis on Duchenne muscular dystrophy he worked as a postdoctoral research fellow in the laboratory of Kevin Campbell at the University of Iowa. In 2003 he joined Newcastle University’s Institute of Genetic Medicine as professor of neuromuscular genetics. Volker has a long-standing interest in the pathogenesis of muscular dystrophies and within the neuromuscular research group at Newcastle is engaged in research using zebrafish and mouse models. He has a special interest in the use of MRI in muscular dystrophies and the insight that contrast-enhanced MRI and quantitative MRI can give into the dynamic processes underlying muscle fibre de- and regeneration.